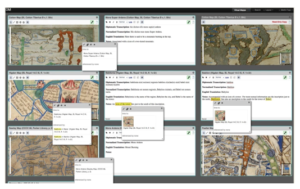 In conjunction with the Schoenberg Institute for Manuscript Studies at the University of Pennsylvania, we are pleased to announce the release of Digital Mappa 1.0 (or DM 1.0), a new digital humanities resource for the easy creation of research workspaces, editions, scholarship, collaboration and open access publications. The premise of DM is simple: if you have a collection of digital images and/or texts, you should be able to produce an online resource that links together specific moments on these images and texts together, annotate these moments as much as you want, collaborate with others on this work, have the content you produce be searchable, and make this work available to others as you wish. And you should be able to do this with little technical expertise. Digital Mappa is a hosted environment available to all faculty, staff and students at the University of Wisconsin. If you’d like to learn more about DM, how it works, and how to get started on your own projects, please go to digitalmappa.org or the Center for the History of Print and Digital Culture’s Digital Mappa webpage. The official release of Digital Mappa also includes a set of publicly accessible showcase projects, hosted at the Schoenberg Institute and here at UW. And if you’d like to try out DM and see how it works, you can go to the DM Sandbox to make a test project. And you can follow us on Facebook and Twitter for more @digitalmappa news and events. Digital Mappa has been made possible with the generous support of the National Endowment for the Humanities, the University of Wisconsin-Madison and the Wisconsin Alumni Research Foundation, the Council of Library and Information Resources, the Schoenberg Institute for Manuscript Studies, the British Library, the UW-Madison’s Department for English and the Center for the History of Print and Digital Culture.